Just because it’s hot and sticky outside, it doesn’t mean you can’t make dessert. Especially one that doesn’t require the oven or stove. This dish is as much a function of the weather as it is the economy. Sure, stone fruits and berries are in season, but my local supermarket was selling cherries for $6.99 per quarter pound. So I’ve been buying bananas instead. When I found free organic vanilla wafers at a street fair, I immediately thought of banana pudding. Instead of making custard though, why not use yogurt? The result was a little tangy, but it was entirely worth the two-minute effort. You really don’t need a recipe (Layer yogurt with cookies and sliced bananas. Refrigerate. Eat. ), but here’s approximate amounts. Line the bottom and sides of a 10-inch pie pan or a wide 1 1/2- to 2-quart dish with wafers. Layer with half the yogurt and bananas. Put another layer of wafers on top, and repeat with the yogurt and bananas. Save a little yogurt and cover the top of the bananas completely, to prevent browning. Cover with plastic wrap and refrigerate for at least 8 hours. Note: Because the bananas and wafers are sweet, you don’t want the yogurt to be loaded with sugar. I prefer plain yogurt and flavor it to taste (1-2 tablespoons sugar and 1/2 tsp vanilla extract). Seek out a high-quality plain yogurt, or else it will be grainy and very sour. I don’t like Dannon, Axelrod, La Yogurt, Stonyfield (the low-fat variety), and Trader Joe’s. Wallaby and Brown Cow are more mild. Although conventional bananas are safe to eat, they contain far more pesticides than American-grown fruit, and are possibly killing off songbirds. Nice and easy, just how I like it! Heh! You had me fooled. Upon looking at the picture, I thought I was going to get a very complicated recipe. This is a great idea, thanks for sharing :D.
Thanks! Ha ha, that old amorphous thing? I had second thoughts about posting the picture, but I only made one small serving. Simple things are often the best. Nice “easy” recipe–I have to try this one because sometimes the condensed milk that is in many banana pudding recipes can be cloying. This looks like a nice balance of the natural sweetness with the sugar in the cookies! Made this yesterday and have to say I actually like the taste better than the standard version. So easy and so delicious. My three little kids gave it an enthusiastic bowl-licking thumbs-up. Many thanks! P.S.–Do you have or know where to find a good homemade vanilla wafer recipe? If so and you (or anyone else reading) has time to share I’d be grateful. Absinthe, I’m glad the recipe turned out well. That’s a good idea about homemade vanilla wafers. Unfortunately, I don’t have a recipe. There’s so many chocolate wafer cookies out there. I wonder why vanilla isn’t as popular. i think the premise could be adapted for a slighter sweeter, less tart version of this nana pudding. 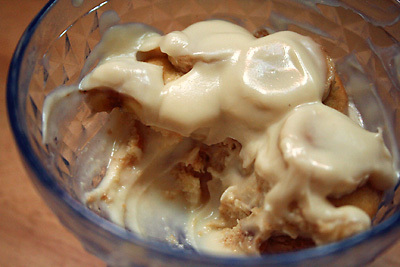 sprinkle brown sugar over the top layer of yogurt/cream and let sit for a while in the fridge, until it’s gooey looking. you may then mix it together–but crunchy bits are tasty, too! your easy recipe is great inspiration for a southern favorite, i’m inspired, thanks!